Looking for traditional flooring ideas, whether for a old house that you're giving an authentic look, or for a modern home that you want to create a period feel for. But what to choose: carpets; wooden flooring; stone; or manmade tiles? With so many options, deciding on traditional flooring for period homes can be a bit of a challenge. So, if you're feeling overwhelmed with the number of options on offer, have a look through this selection of our favourite traditional flooring for period homes; we guarantee you'll find something that you love and that's perfect for your home. For more advice, read our guide to choosing the right flooring materials; and don't miss our flooring hub page for buyer's guides on every imaginable flooring subject. Timelessly beautiful, wooden flooring is one of the most desirable features in a period property due to its authentic, natural appearance, durability and warmth underfoot. We’ve compiled the best designs for your home. Inspired by the vastly popular Nordic trend, paler finishes for wooden floors are becoming increasingly popular in British homes of all ages. Complementing a more minimalist design scheme, grey and light-toned floors add a modern flair to a period home. If you love Scandi style, then take a look at our 10 cosy Scandi room design ideas. Honey-toned oak flooring is perfect for rooms that you want to feel relaxed and welcoming. It also beautifully complements any original oak features such as wooden doors, beams and furnishings. Use our guide to picking the best wooden flooring for more in-depth, practical advice. Reclaimed timber is the closest you can get to authentic solid wood flooring in a period home. Having had a longer life than newer boards, reclaimed wood is less likely to split as it has been exposed to both hot and cold environments for many years and so will have already expanded and contracted to its full potential. This makes it stronger and more durable than its modern counterparts, and the denser grain means the wood is less likely to warp. Its authentic colour variations and aged quality gives a reclaimed floor a unique personality. Prices start at £360 per m² from The New and Reclaimed Flooring Company. Engineered wood flooring is constructed of a wear layer and multiple base layers. The wear layer is comprised of real wood, such as oak or walnut; below this are base layers, usually made from cheaper or composite wood, which are attached to the wear layer to provide stability and strength. Once laid, there are no obvious differences between engineered and solid wood floors but, due to only having a wear layer of timber, engineered boards are more cost effective, though they can only be sanded once or twice in their lifetime. Another benefit of engineered wood is that it is perfect for pairing with underfloor heating. This Summer engineered oak flooring, £57.99 per m², from the Palazzo range at Carpetright, makes a feature of knots and imperfections, adding a greater depth of character to both the floor and to the room as whole. Perfect for living rooms in Georgian townhouses, Arts & Crafts cottages and contemporary Victorian renovations, parquet flooring is a geometrically designed pattern of wood flooring. Created using smaller staves of wood, rather than planks, it can be either solid or engineered. The most common pattern to lay is the crossed ‘herringbone’ design, although the block form allows you to create bespoke patterns as well as the more traditional. If you love the look of wood but want something a little more budget friendly, luxury laminate wood-style flooring will achieve a similar finish at a fraction of the price. It is simple to install and compatible with underfloor heating, while its waterproof qualities make it well suited to bathrooms. Laminate flooring is comprised of multiple layers of melamine resin and fibre board. This is then covered by a very high-resolution photo of real wood, which can be extremely realistic, and is sealed with a layer of clear protective film. Though laminate only offers the illusion of a solid wood floor, it is popular due to its low cost, durability and ease of installation and maintenance. Bamboo is a less traditional option, but its popularity is on the rise due to its sustainability and resilience. Although it’s actually a type of grass, it has a unique grain pattern (similar to wood), which can be worked into boards. Bamboo flooring is water-resistant but it is not totally waterproof and so is not recommended for use in bathrooms. With a variety of colours, veinings and textured undulations, stone is a timeless flooring choice that will work in most rooms of the home. 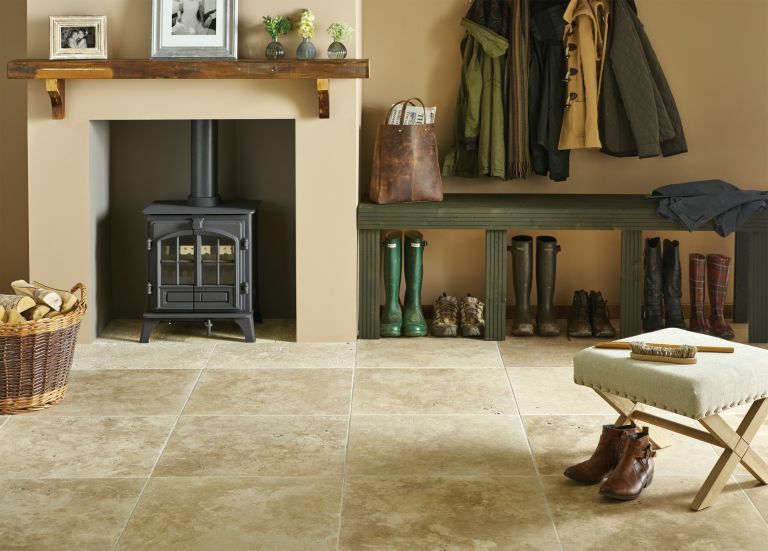 Take a look through some of our favourite choices then go on and check out our expert guide to choosing real stone flooring for more in-depth advice. Ribble Reclamation ensures its flagstones retain their natural foot-worn patina, resulting in a floor that looks as though it could be original to the property. These reclaimed Yorkstone flags cost £200 per m2. Opting for reclaimed stone enables you to get the closest you can to a traditional floor that has been walked on for centuries. It is essential to use a good sealer on the stone to prevent degradation; selecting a sealer with a matt finish helps to retain the floor’s authentic aged appearance. If you decided that reclaimed flooring is perfect for your home, make sure you take a look at how to maintain and repair old stone floors. Travertine flooring is known for its honeycomb structure and visible surface pitting, which adds a unique quality to each individual tile and creates an impressive overall appearance. It looks particularly beautiful in country cottage homes. Bear in mind that previously unexposed holes may become visible through general usage and will need refilling with a suitable resin. Used in ancient buildings for millennia, marble elevates any room and comes in a spectacular range of shades and veining. Particularly stunning in bathrooms, marble’s dense nature makes it perfect for polishing, with the glassy finish being a popular option. However, marble also lends itself to being honed (where the surface of the stone has been ground to a smooth, flat, consistent surface) or tumbled (where tiles have been put in drums to soften and age the edges and surfaces) for a more rustic effect. Despite the many positives of a real marble floor, it is often accompanied by a high price tag, which becomes particularly notable when marble’s delicacy is taken into account. For a more affordable and hardwearing option that still allows you to achieve the gorgeous colour variation and veining effects of the stone, opt for a porcelain marble-effect floor. a bathroom or en suite. This Peppermint Pebble flooring, £49.29 per m² from Mandarin Stone, introduces plenty of colour variation, while the uniquely textured surface provides extra interest and luxury to your sanctuary. Carpet is certainly the most comfort-enhancing option, making it a popular addition to living rooms and bedrooms. From organic natural fibres to rich sumptuous wools, find out which styles and materials will work best in your home. For more in-depth advice on costing, sourcing and fitting carpets visit our how to choose a carpet guide. Neutral, lighter-coloured carpets can be a challenge to keep clean, particularly for younger families or those with pets. Man-made materials, however, as opposed to more natural alternatives, can withstand more vigorous cleaning methods. This means you can keep your new carpet in pristine condition, no matter what shade you choose. Check out our guide for the best way to clean carpets for more on this. This Richmond twist carpet in Parchment, £11.99 per m2 from Carpetright, is woven with additional stain-guard fibres, allowing you to use lighter colours in even the most high-traffic rooms of your house. Twist-pile carpets are a good choice since they are woven with twisted fibres, giving them a resilient texture, so are able to withstand lots of wear and tear, yet provide a comfortable surface underfoot. Seagrass cannot be bleached or dyed, but instead the yellow and dark green colour variations are the result of different harvesting times. Once fitted, the colour develops a richer intensity in response to its environment, so therefore every seagrass carpet is unique. Find out more about choosing natural flooring in our comprehensive guide. Dark-coloured carpets have a reputation for making rooms look smaller, but opting for a colour midway between light and dark (above) can create a cosy environment if used in a small room, and can make larger spaces feel less imposing. A truly dark carpet (below) can look stunning in a dramatic room scheme, and is also much more forgiving of stains and markings. Be inspired by more dark and dramatic decorating ideas in our design gallery. While bold patterns can be overwhelming in small spaces, a brightly coloured or ornately patterned carpet creates an inviting focus in larger rooms. Team with neutral walls and furnishings to prevent the room from feeling too busy. The most durable of carpeting materials, coir is perfect for high-traffic rooms or areas where other natural fibre carpets would quickly degrade. As it’s also extremely environmentally friendly, coir is becoming an increasingly popular option. It is more water resistant than other carpet materials, which makes it ideal for hallways, kitchens and areas next to exterior doors.